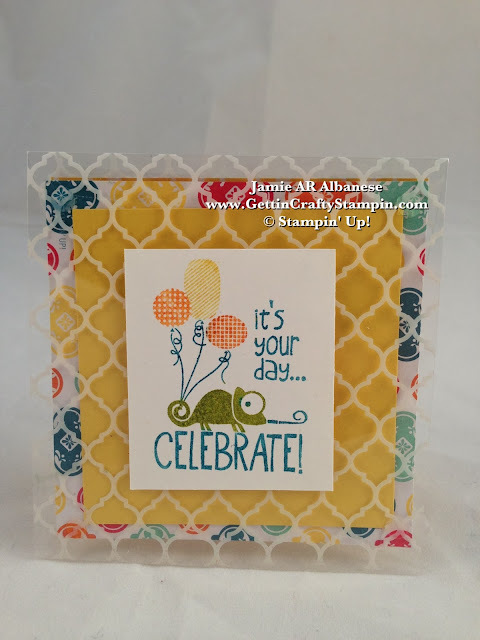 Getting Crafty with Jamie: It's your day... Celebrate! 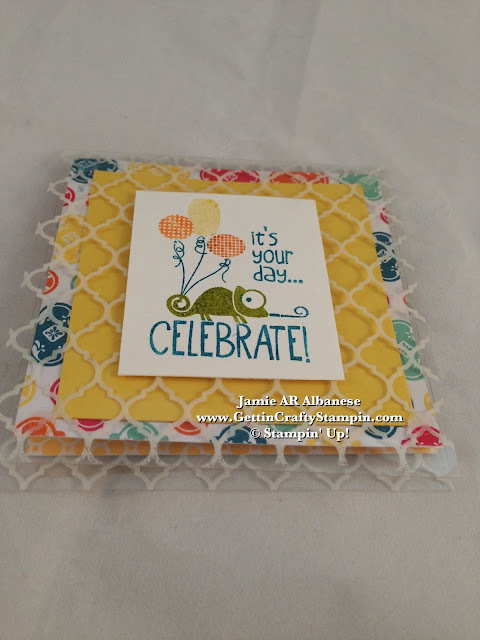 With a colorful floating hand-stamped card! It's your day... Celebrate! 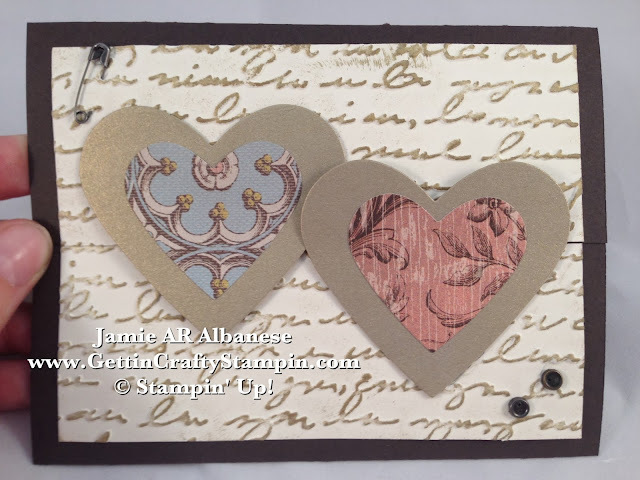 With a colorful floating hand-stamped card! Celebrate the day, young and old(er), with color and excitement! 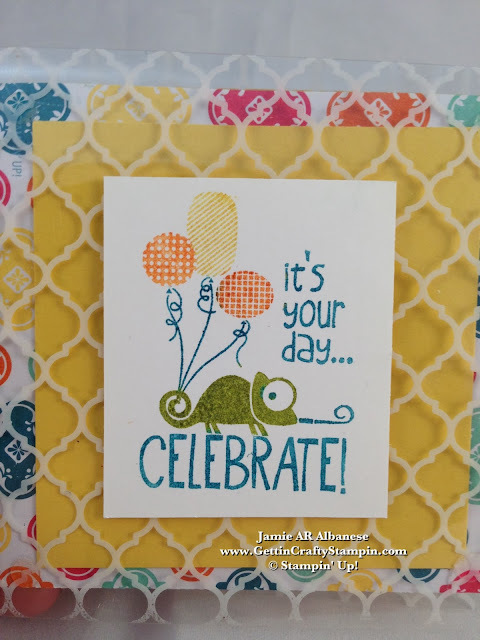 This colorful hand-stamped card 'floats' as it delivers smiles and celebratory wishes! Go ahead, send a 'floating' card, balloons and all, with this cool Quatrefancy Specialty Designer Series Paper and it's patterned window sheets! Start with cutting the Mosaic patterned window sheet into a 4'x8" strip. Score at 4" and fold, creasing with the Bone Folder. You have created the base for a 'floating' card!! This adorable chameleon is reminiscent of the little guy on the popular Tangled/Rapunzel movie (a favorite of our Disney movies). This Tag It stamp set has a great collection of fun stamps and serves a higher purpose as Every Purchase of this stamp set supports Ronald McDonald House Charities (RMHC) and families during their hard times!! 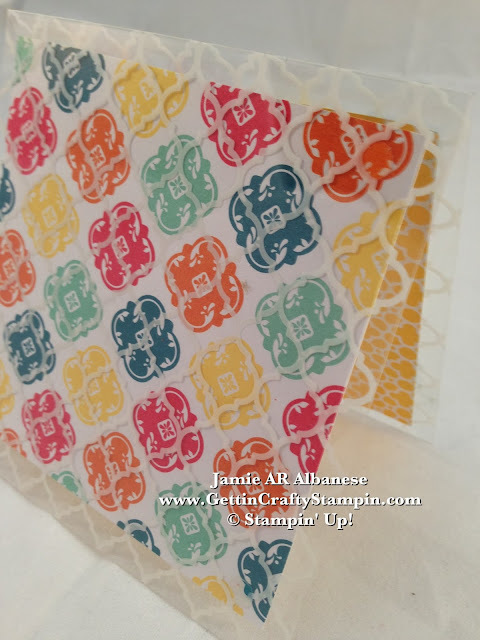 Color/Paint directly on the stamp with the Stampin' Write Markers. Huff and place on a piece of Whisper White card stock. I love how the colors are all coordinated so that my projects come out sharp. 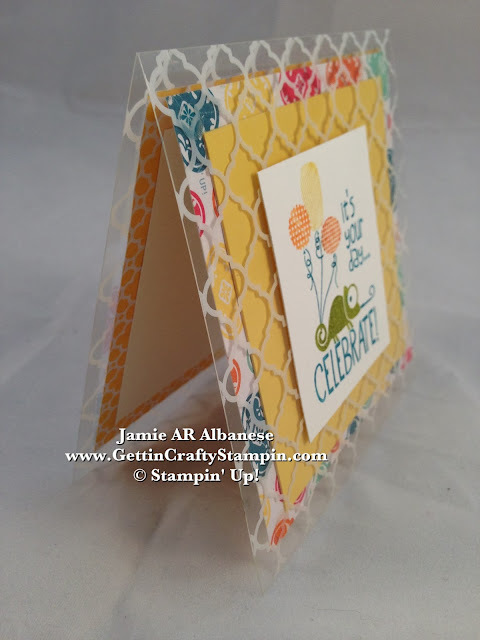 Cut the colorful and patterned Quatrefancy page into 3-1/2" square. You need two. Have one piece of 3" square Whisper White and Daffodil Delight. Center the Daffodil Delight on one piece and Whisper White on the other. Using Glue Dots on all four corners. This will be a clear adhesive that is ideal to hold to the Window sheet card. By having it cut 1/2" shorter, it will float. Center the back against the front and squish - this will make it layer perfectly! Using the Glue Dots, adhere the 'Celebrate' image on the front of the card. It is now framed and coordinated with the patterned and solid card stocks and window sheet. Because our Designer Series Paper is double sided, the coordinating image and color will be on the inside. It is sturdy as the Window Sheets are top notch. A perfect 'floating' card! From behind it's sharp and colorful! A perfect card that will surely live for much longer than the party on one's shelf, wall or fridge. 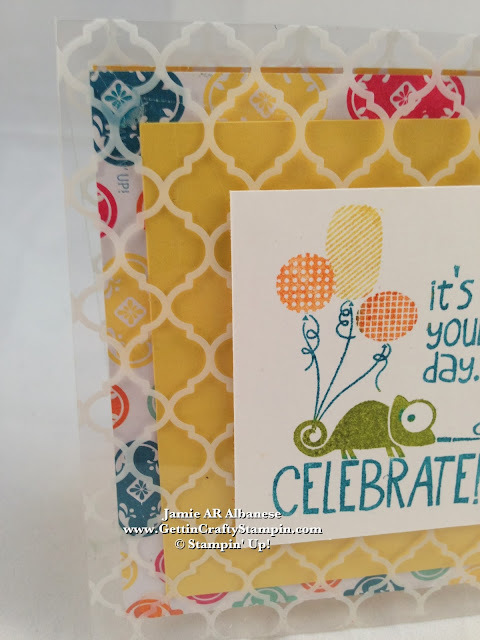 This colorful card is ideal to celebrate someone's day.. no matter their age! Light up their life and send some color and style. Wrap this up.. 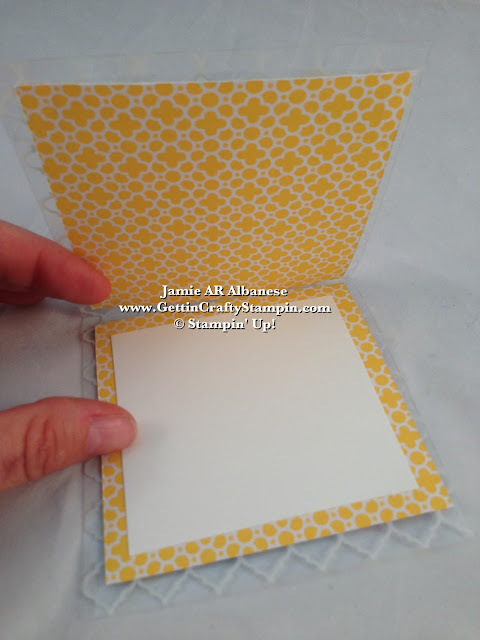 Send this 4" square card in a coordinated envelope!! Sure.. using the Quatrefancy Specialty Desinger Series Paper with our Envelope Punch Board (#133774) and you can hand deliver or mail this card 'wrapped' extra special and coordinated!! I celebrate that you came by today! Please come and visit often as I try to post daily projects and tutorials. Share me with your friends and family. Join me in my Upcoming Classes (on-line and in-person) Join My Team creating memories and celebrating life with others as you make money and friends! 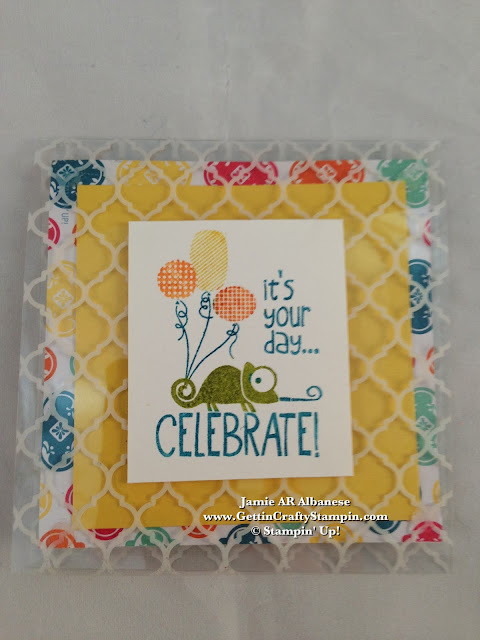 Send some color and fun with this floating card! Rise above the rest in color and style when you send this memorable card on someone's special day. Have fun with our Specialty and full line up of Designer Series Papers... create works of art that will make someone's day special!